Richard Neutra would not only surprise America with his exciting designs in architecture, but he would find himself being the talk of a small town in Southern California. Commissioned by Mr. and Mrs. James Moore to design their unique Ojai home, Neutra realized that the structure would indeed become one of the most famous of all his private dwellings. 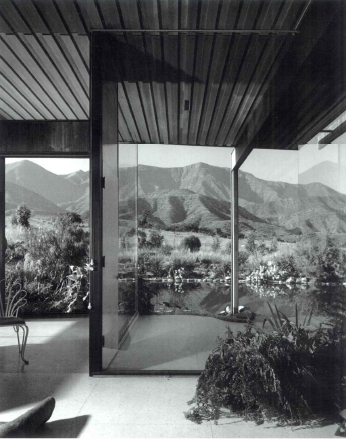 This, however, was not the first house Neutra designed in Ojai. In 1943 Howard Bald had used the talented architect for his home in the East End of the valley. Bald had arrived in Ojai in the spring of 1900. He was 8 years old and ill from tuberculosis. The doctors had recommended that Bald be brought to Southern California for the mild climate. Bald would spend many years working for the Forest Service in the backcountry of Ventura County. Far from the valley, Neutra was born in Vienna in 1892; and, before coming to America, he had attended the Technische Hochschule in Vienna and the University of Zurich. In 1923, he won an international award for an architectural drawing he had done, and the prize enabled him to travel to the United States. Upon his arrival in America, Neutra spent a short time working with the famous Frank Lloyd Wright. Neutra was well-influenced by Wright, with his ideas that the concept for each house be of the open plan and extend beyond the boundaries of the house itself and into the surrounding landscape. This plan would eventually be the important element that made Neutra famous. In 1925, Neutra and his wife Dione settled in the golden state of California. The state became much more dazzling as the striking homes designed by Neutra began to appear on the lush hillsides. Neutra’s reputation did not become fully established until the first Lovell house in Griffith Park was completed in 1929. As the first steel-framed house built in the International Style in the United States, the Lovell house is of unparalleled historical significance. It’s also known as “Health House,” derived from the fact that Neutra’s client, Dr. Philip M. Lovell, who was a fitness expert, wanted to build a house that would symbolize physical well-being. To this end, he invited those interested in the project to visit him as soon as the house was completed; and Neutra conducted the tours, which resulted in more than 15,000 people being able to see and admire it personally. Before World War II, very few commissions for buildings had been awarded to architects of the Modern Movement, although the Modernist aesthetics had been deemed acceptable for functional buildings, such as factories. After the war this changed, and one of the reasons was the psychological desire to leave the past behind and go on to things that were new. The people were beginning to respond to the modern designs, having become tired of buildings that appeared to be old-fashioned in style. By the 1950s, all of America was wanting to look to the future. Neutra’s designs became less heroic and more serene than some other Modernists of the period. The Bald house was basically rectangular in shape, single-story with a flat roof. To take advantage of its sweeping view of the whole valley, the west side of the house was built primarily of floor-to-ceiling glass walls. For the highly-acclaimed Moore house, Neutra integrated the building within the landscape. The scale of the windows in which it was sheathed meant that during the daytime the landscape became an integral living component of the interiors; and at night, throwing out its light, the house acted like a beacon on the mountainside. Taking full advantage of the serene beauty of the landscape in which it is situated. The low-lying building did not attempt to compete with the visual power of the mountains but to exert a quiet aura and potency of its own. In this house, Neutra adopted an idea that he had successfully exploited earlier—frame-less, mitered, glass joints in the corners of rooms—to allow the maximum amount of light to enter the house, and to provide a completely uninterrupted view of the surrounding mountains. The distinction between the interior and the exterior has been all but abolished by the use of glass walls. Neutra’s buildings received considerable attention and media exposure during the 1950s, both in America and abroad; and, in the field of domestic architecture, he was clearly the most celebrated and influential figure of that time. Today, these two outstanding examples of Richard Neutra’s architectural designs are an important part of the Ojai Valley. Neutra is but one of the many contemporary architects who worked their magic in the valley. The design period of the 1940s and ’50s warrants closer attention and deserves greater respect. Note: Richard Neutra had some connections with another Ojai resident, Krishnamurti. Neutra’s early patron, Kees Van Der Leeuw, had helped organize Krishnamurti’s talks in Ommen, Holland. The Moore’s, whose house Neutra designed in Ojai, moved to Ojai because of Krishnamurti. Neutra’s son, Raymond, attended Krishnamurti’s first school in Ojai–the Happy Valley School. Neutra once gave a talk at Happy Valley School on the psychology of modern architecture; his wife played cello in the background.